Swing, stride, ride or glide through some tinglingly good Aussie locales with these great new adventure tours. Sightseeing can often lack something. A visceral, full-body engagement with your environment that alerts you to the reality that you are, in fact, alive – spirit, body and mind. Adventure tours are quite different however, combining sightseeing with adrenaline – exhilarating reminders that your body was built for the wild. Australia’s vast and rugged wilderness has a way of making this realisation sweeter, so why not check out the following adventure tours, ranging from soft to the hard, and live a little people? A new adventure cruise for all you softies out there, while not exactly pumping the blood or the endorphins, will definitely satisfy a few of those wilderness-won exhilaration receptors. The coastline of Bruny Island is as wild and rugged as lovers of wild and rugged could wish for and Bruny Wildlife Adventure delivers it all close up with the aid of Adventure, a custom-built coastal exploration water vessel which registers very high on the comfort, viewing, amenity, safety, speed and excitement-meter. The tour starts on the streets of Hobart, from which you are whisked away on a luxury catamaran to the appropriately titled Adventure Bay on the south coast of Bruny Island, south of Hobart. 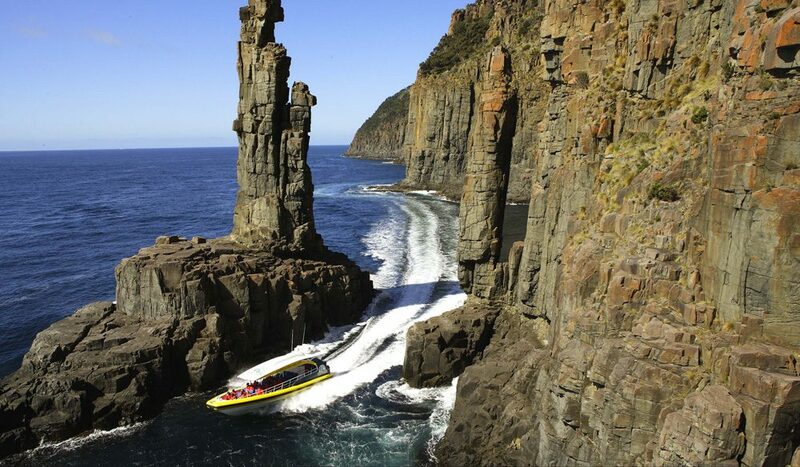 From here you board the aforementioned Adventure to explore the islands sculptured coastline with its high coastal cliffs and wildlife (including sea eagles, dolphins and penguins), all while receiving direct images of the water world below from Adventure’s undersea cameras. You will also get up close to some of the oceans most lovable animals when you visit a seal haul-out. Then – now, you softies will really like this – you’re taken to dine at HIBA, home of Bruny Island Fudge, in an alfresco dining area five minutes north of Adventure Bay, where you’ll be treated to individual regional lunch platters, Bruny Island Oysters, Cheese and of course fudge. Then . . . well, then you’re back on the streets of Hobart to do as you please. Wilderness Wonders, a new tourism venture, in Port Lincoln, South Australia, is now providing lovers of a healthy blood flow with a chance to engage in the spectacular sculpted cliff side ecology of the lower Eyre Peninsula. Their walking tours are hosted by talking nature encyclopedias (knowledgeable guides) who will fill you in on any area of interest you might have (ecology, geology or history). Take in the high cliffs, blowholes, beaches, wildlife and wildflowers on a Whalers Cliff Top Wander, a two day walk with one night staying at a campsite with hot showers, toilets and luxury tents – dinner includes delectable cuisine and fine wine. Or, do the Sleaford Wander, a 5-hour walk across sensuous sand dunes and fabulous beaches. For the not quite as hardened traveller, Wilderness Wonders 4WD tours don’t disappoint either. Explore the Coffin Bay National Park on the Coffin’s Beach and Bush Drive (6-8 hours; $160 per person) or take in sand dunes and secluded beaches on the Wanna Dune Drive. The Currumbin Wildlife Sanctuary on the Gold Coast is a world leader in the display and preservation of Australia’s wildlife and natural heritage. 1400 animals and birds roam the lush and leafy sanctuary, offering fantastic opportunities to get up-close with some great Aussie beasties. Now, Currumbin Wildlife Sanctuary is offering the Extreme Green Challenge, presented in association with Adventure Parc – the enormously popular French adventure tourism phenomenon. Surrounded by exuberant flora and fauna you’ll be set a series of 14 challenges (incorporating elements of SAS commando training) which include rope bridges, ladders high into the treetop canopy and a ‘yes, you are a wild and primitive hominid aren’t you’ flying fox ride over crocodile infested wetlands.